WE ARE STANDING IN THE COURTYARD OF Mount Olympus Academy,” a goddessgirl named Artemis announced to the tour group gathered around her. The seven girls in her group, who were visiting MOA for the next few days, followed her gaze. The majestic academy—built of gleaming white stone and surrounded on all sides by dozens of Ionic columns—stood right behind her at the top of the granite staircase. “Wherever that is,” she heard one of the Amazon girls in her group whisper. Her name was Penthesilea. Dozens of silver bracelets jangled noisily on her arms as she moved. Another Amazon girl, named Hippolyta, smacked the gum she was chewing and shrugged. Ye gods! Why did I have to get these two mean Amazon girls in my group? Artemis wondered. They wore platform sandals, stood ten inches taller than any of the other girls, and were known for being bold and brash. Still, they didn’t have to be rude! Artemis’s goddessgirl friend, Persephone, sent her an encouraging smile. She was helping lead the group and was always trying to make sure everyone got along. Artemis nodded. In truth, she couldn’t really blame the Amazons for being a teeny bit bored. They’d come to take part in the very-first-ever girls-only Olympic Games. Only two days away! A thrill of excitement shot up her spine at the thought of the upcoming competitions. Although everybody was calling them the Girl Games, their official name was the Heraean Games. Zeus, the principal of MOA, had named them after his new wife, Hera. And it was Hera’s idea to have MOA students give these tours to visiting girl athletes. It was a good idea, Artemis supposed. The problem was that she didn’t really have time to play tour guide. She had too much other stuff to do to get ready for the Games. Like her, these girls would probably rather be off practicing for their own athletic events right now. After all, there wasn’t much time left! Noticing that Artemis had gone quiet, Persephone took over as tour guide for a while. “Let’s go look inside the Academy next,” she suggested to their group. Her long, wavy red hair brushed her pale arm as she turned and led them all up the granite staircase. Artemis followed, her mind full of the megazillion tasks she still needed to do to make sure that everything on Game Day would go off without a hitch. These girls-only Olympics had been her idea, and she didn’t want them to bomb. How awful would that be? Her stomach tightened as she pushed through the enormous bronze doors of the Academy. Just thinking about the possibility of failure stressed her out. Everyone was counting on her. An awed silence fell over the girls in their group as they filed inside, entering the main hall. Persephone went over to a golden fountain against one wall. She turned it on for a second so that glittery liquid spurted from its spout in an arc. “Instead of water, the fountains here at MOA spout nectar,” she said. “Nothing. It has no effect on mortals,” answered a green-skinned mortal MOA student passing by. Medusa. She and another mortal girl named Pandora were leading a tour group of six girls. Medusa was wearing her stoneglasses, which were sort of like sunglasses. Without them, her gaze would have turned Pandora and every other mortal she gazed upon to stone. Including the Amazons. Hey, maybe that wouldn’t be such a bad thing! Artemis thought, grinning to herself. As a fitting symbol of her curiosity—and constant questions—Pandora’s blue bangs were plastered against her forehead in the shape of question marks. As Medusa, Pandora, and their tour group rounded the corner and went out of sight, three of MOA’s cutest godboys entered the front hall from the other direction: Ares, Poseidon, and Apollo. As soon as they saw the new girls, they began to show off. Ares flexed his muscles. Poseidon twirled his trident (a three-pronged spear) over his head. And Apollo, who was Artemis’s twin brother, flashed his widest smile and waved. Artemis rolled her eyes. She was just about to shoo them all away when a mortal boy came to join them—Actaeon. Seeing him, her face grew hot. He was her crush. She wasn’t totally sure he liked her, and she didn’t know if he knew she liked him either. It was all very complicated. Feeling weirdly shy, she looked away from him. Her eyes happened to fall on one of the Amazons—Penthesilea, who was staring from her to Actaeon and back again. Catching Artemis’s gaze, she smirked knowingly. “Ooh! Those MOA boys are so cute,” Penthesilea cooed. “Especially that mortal one. Right, Hippolyta?” She elbowed her friend. Grrr. Artemis glared at them. Amazons had the reputation of being sports-crazy, not boy-crazy. So why was Penthesilea suddenly acting so ga-ga over Actaeon? Ares and Poseidon decided to head down the hall after Pandora and Medusa’s tour group. But Apollo and Actaeon broke away and came over to Artemis’s group. Penthesilea’s bracelets clanked as she ran a hand over her short brown hair. She smiled at Actaeon and he smiled back. “Back off. Actaeon’s my crush!” Artemis told her. Well, she didn’t say it out loud, of course—just in her head. “How’s it going, sis?” Apollo asked. “Hi, Artemis,” Actaeon said at the same time. At the sound of the boys’ voices, Penthesilea pretended to swoon. The quick-thinking Actaeon caught her before she could hit the marble floor. Unfortunately. “Thanks,” Penthesilea murmured, smiling up at him and batting her eyelashes. What a faker! thought Artemis. Apollo’s eyebrows rose. “Whoa! I’ve never had a girl faint at the sight of me. Usually they run away.” It was true. Her brother’s first crush was a nymph who’d turned herself into a laurel tree rather than tell him she didn’t like him. Actaeon slapped him on the back. “Maybe things are looking up for you, god-dude,” he said with a grin. It was nice of him to say that, thought Artemis. Only, she was pretty sure that it was Actaeon rather than Apollo that Penthesilea had pretended to swoon for. Good thing Persephone was a pro at jumping in to smooth over awkward situations, thought Artemis. Persephone’s introductions gave Artemis time to take a deep breath. Principal Zeus had said that part of the purpose of the Games was to promote a friendly cultural exchange. They were supposed to be on their best behavior. So, beaning Penthe over the head with her tour guide scroll probably wouldn’t be the best way to impress Zeus. And it definitely wouldn’t promote goodwill among cultures! Artemis relaxed her fist. Godzooks! Speaking of Principal Zeus, here he came now, stomping down the hall toward them wearing a dazzling white tunic and golden sandals. The girls in her group gasped, their eyes rounding. She couldn’t blame them. He was pretty intimidating. Artemis expected him to pass them by without speaking. But to her surprise, he stopped. Yikes! Right in front of her! His piercing blue eyes practically bored holes right through her. “Aren’t you the one in charge of the Games?” he demanded. Her throat tightened a little. Uh-oh. Was there some trouble she didn’t know about? “Yes, sort of,” she replied, her voice coming out as a squeak. How embarrassing! But who wouldn’t be nervous to have the principal looming over them? Especially since he stood seven feet tall with bulging muscles! Not only was Zeus the MOA principal, he was also King of the Gods and Ruler of the Heavens. There was no one more powerful! Or fearsome. “Oh. Thanks.” Artemis jumped as a tiny jolt of electricity passed through her when she took the key. Zeus’s touch was electric—literally. He could fry you with a mere flick of his fingers if he wanted to. In the corner of her brain she heard Persephone lead the rest of the tour group farther down the hall to look at the MOA trophy case while Artemis was busy with Zeus. Unfortunately, Apollo and Acteaon went along to explain some of the sports trophies and banners on display there. Penthe was sticking to Actaeon’s side. “Preparations? Oh, you mean for the Games, right?” Artemis had a feeling he didn’t really want to hear about all the problems. Like that the stuffed beanbag animals for the relay races hadn’t been delivered yet. She would have preferred that the girls hand off traditional batons rather than stuffed animals. But she’d given in to her three best goddessgirl friends on that issue. Besides checking on the beanbag order, she also needed to find out if the new targets had been delivered for the archery competitions. At least the extra pink sand she’d ordered for the long-jump pits had come. That was one thing she could check off her long to-do list. Tap. Tap. Tap. The toe of one of Zeus’s golden sandals tapped the shiny marble floor impatiently. “Well?” he prompted. She panicked for a second when she realized she was no longer holding it. But then she found it in the pocket of her chiton, where she’d automatically tucked it away. Phew. “Don’t worry. I won’t!” she called after him. “Wow!” a girl said when Artemis rejoined the tour group by the trophy cases. “You are so brave.” All the girls in the group were gazing at her in awe now. “I’d be scared to death to talk to him!” another girl added. “It was no big deal,” Artemis replied with a shrug. If you acted brave, people usually believed you were. She’d figured that out in Beast-ology class while facing off against some pretty terrifying creatures. But she was feeling antsy to get that pink sand delivery sent to the long-jump pits. Should she go? Persephone could probably handle the rest of the tour on her own. Especially now that Actaeon and Apollo were helping. Still, Artemis hated to leave Actaeon and Penthe here together. She glared at them, chatting away. This whole tour idea of Hera’s was turning out to be a disaster, in her opinion. The front doors opened behind them and another tour group entered the front hall. They were laughing. Obviously the girls in that group were enjoying their tour, she thought. Aphrodite and Athena were leading it. Aphrodite was the goddessgirl of love and beauty and Athena was the brainiest girl at MOA. 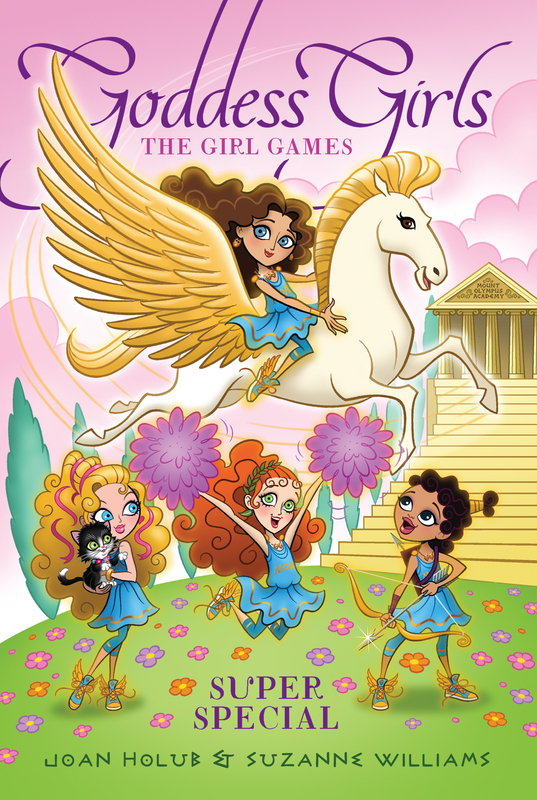 Together with Artemis and Persephone, the four goddessgirls were all best friends, and the most popular girls at the Academy. Glancing up, Aphrodite caught Artemis’s eye and winked. Her long golden hair glistened in a ray of sunlight that shone in through a high window. In honor of the Games, she’d threaded her hair with blue and gold ribbons—MOA’s colors. The same double-G gold charm necklace that each of the four goddessgirl friends wore dangled at her throat. Whatever funny thing Aphrodite had told her group to make them laugh, it couldn’t have come from the official MOA tour guide scroll, Artemis decided. That thing was as dry as month-old ambrosia toast! “You sure?” Artemis asked. She’d scoped out the other archers too. The two Egyptian goddessgirls had looked pretty good. But these Amazons, and one of the Norse goddessgirls, were going to be toughest to beat. Still, as much as she wanted to be off practicing, and as much as she needed to check up on game preparations, she also felt like she should see the tour through to the end. “Yes! Go,” said Persephone, making shooing motions with her pale hands. “Okay. Thanks.” Big-time relieved, Artemis let go of her guide scroll. It rolled itself shut in midair with a loud snap. “Go, scroll. Zoom! Up to my room!” she called out before it could hit the floor. Artemis grinned and bowed as several of the girls in her tour group applauded. She should’ve thought about using magic to liven things up before. To mortals, nothing was as fascinating as the magical feats immortals could perform! Mortals that weren’t Penthesilea, that is. She was still talking to Actaeon. Neither of them had even noticed when the guide scroll whooshed away. Well, worrying about that Amazon was a waste of time, Artemis decided. There were other, more important things to worry about. Principal Zeus was counting on her. And so were the girls! To make sure that the Girl Games wouldn’t end up as a one-time thing, she needed to make Zeus proud. And that meant everything had to go perfectly. With her mind stuffed full of details she needed to take care of, Artemis took off, promising to meet Apollo for target practice later that afternoon.